HS3, the planned fast rail link between Manchester and Leeds, needs 'kick-starting' as part of a broader plan to improve transport links in northern England, a report has concluded. The National Infrastructure Commission (NIC) also called for improvements on the most congested part of the M62 to be brought forward. It said the region needed "immediate and very significant investment". The government is backing the plans and Lord Adonis, former Labour transport secretary and chair of the National Infrastructure Commission said that if the north was to become a powerhouse, work needed to "begin as quickly as possible". 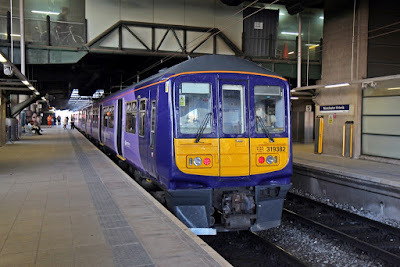 "Leeds and Manchester are just 40 miles apart but there is no quick and easy way to travel between the two. In rush-hour it can take more than two hours by car, by train it can be almost an hour. "So we should kick-start HS3 across the Pennines and slash journey times to just 30 minutes. But we must not wait decades for change - journey times should be cut to 40 minutes by 2022." A plan should be drawn up by 2017, the report said. Lord Adonis also said that improvements to the M62 should ensure that road journeys between Liverpool and Leeds would be cut by up to 20%. Other recommendations include redeveloping Manchester Piccadilly station and incorporating key parts of the north in the HS2 train network. The NIC was set up by the government last year to advise on long-term projects to boost the economy. The Government is to commit £75m to explore plans for a new trans-Pennine road tunnel and bring forward £161m for upgrades to the M62 Liverpool-Hull motorway. A full blueprint for HS3 will be drawn up next year. In total, £300m for transport projects have been announced by the government - although almost half of that money was committed in last year's Autumn Statement. Almost everyone from all sides of the political divide agrees that this is A Good Thing and it has been welcomed by Labour and Conservative MPs. However, it’s also something that has already been announced on many occasions, even before anyone had even invented the name “HS3”. The main improvement has already been announced. It’s the electrification of the York to Manchester railway line. It was briefly cancelled by the government after the 2015 general election, only to be restarted months later following an outcry from northern business and politicians. This is the bit that – even before High Speed 3 was invented – was going to cut journey times to 40 minutes. In fact, it’s has been announced so many times that Osborne first unveiled it in his 2011 Autumn Statement, when it was due to be completed by 2019. But now, because of the delay, it won’t be completed until 2022. Osbourne has committed £60 million to building a plan for High Speed 3, which will aim at some point after 2022 to reduce the journey time between Leeds and Manchester beyond the current target of 40 minutes. Although the headline target is to reduce journey times to 30 minutes, this seems to be based on a line in the report which suggests that “new tunnels and/or the use of disused track” could reduce journey times between Leeds and Manchester “by between 1 and 10 minutes”. In short, Osborne has pledged money to develop ambitious plans for HS3. These plans will then require a substantial amount more money if they are to be made a reality. Crucially, most of the HS3 plan involves upgrading or building stretches of new railway alongside the existing track rather than pushing ahead with an entirely new build. Ed Cox, director of the IPPR North think tank, said there’s a lot still to be done and that the region is still losing out on investment compared to the capital. “It is important to remember though that project development work is no substitute for spades in the ground and only raises expectations about the government’s ambitions for the North,” he said. “In due course, government will be expected to invest significant amounts of public money to finally get the construction of these projects off the ground, just as it has done with Crossrail in London.